Watering broccoli plants regularly is the key to the development of large, thick heads of broccoli. Broccoli plants are heavy feeders. They use moisture in the soil to absorb vital nutrients. 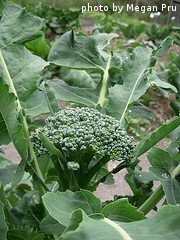 If your soil is not nutrient rich there are several ways to fertilize your broccoli plants. Broccoli plants need at least an inch of rain per week to grow successfully. They can even handle a little more. If no rain falls in your area, you'll have to water them yourself. Slow, deep soaks are best. If you use a garden hose, keep the water pressure low to avoid soil erosion at the base of the plants. If you want to put a sprayer on the end of the hose, that's fine. Just put the sprayer on a low pressure setting such as sprinkle or mist. You can also water with jugs or watering cans. When watering broccoli, focus your effort at the base of the plants. If you avoid watering the tops of the plants, there will be less chance of diseases developing. 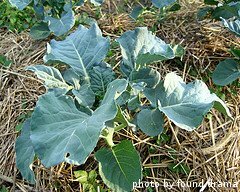 A layer of mulch can also be applied around broccoli plants to keep the the soil moist. Grass clippings, chopped up leaves or straw work well as mulch. They also help prevent weeds from growing in your broccoli patch. Additionally, these materials can be tilled under at the end of the growing season to add nutrients to the soil. 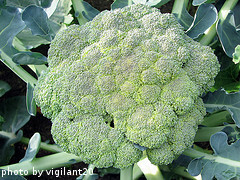 Broccoli plants are heavy feeders and will do well with a dose of fertilizer every couple of weeks. Use a well balanced fertilizer for best results. This will give the plants enough energy to get large enough to support full heads of broccoli. One option is to use a balanced granular type fertilizer. 10-10-10 or 14-14-14 blends work well. These three numbers indicate the amount of nitrogen, phosphate and potassium respectively that are contained in that particular fertilizer. Check the package label for the manufacturer's suggested application rate. Most granular fertilizers are applied at a rate of 1 1/2 pounds per 100 square feet. Just scatter the granules around the plants. Try not to let the granules touch the broccoli plants as it may burn them. Once the granules are scattered, water them in well. You can start applying granular fertilizer when the seedlings have been transplanted and are 4-5 inches tall. You can also use a water soluble type fertilizer. Mix it according to the manufacturer's directions and apply it when you water your broccoli plants. You can use a hose end sprayer or mix the product in a jug or watering can. If you decide to use a water soluble product, start fertilizing broccoli plants as soon as you transplant them. We scatter a balanced granular fertilizer in our broccoli patch about a week before we transplant our seedlings. We also scatter in some lime. We water it all in and then till the soil one last time right before we plant. After that, we switch to a water soluble fertilizer and apply it about once a month. If you are interested in growing broccoli organically, you can work some compost or well-rotted manure into the soil before planting. You can also use organic products like fish emulsions to fertilize your broccoli plants. Most garden centers carry organic fertilizer products. If you decide to fertilize with an organic fertilizer, just make sure it is well balanced. Now that you have learned about fertilizing and watering broccoli plants, it's time to think about harvesting those tender heads.